15 June 2014 [updated with December 2014 survey results]. Article by Karl Fjellstrom, for ITDP. A key part of BRT corridor design should be to try to ensure high quality bike facilities along the BRT corridor, making cycling a more attractive option. 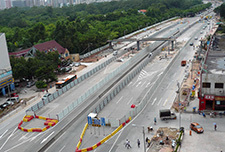 Despite numerous issues with bike lane connectivity, especially across intersections, a dramatic transformation of perceptions of the quality of the cycling environment along the Guangzhou BRT corridor has been achieved. 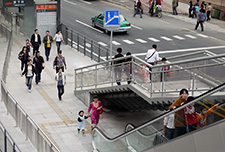 ITDP's impact analysis surveys related to the Guangzhou BRT system included interviews of cyclists along the BRT corridor as well as in a non-BRT corridor, for comparative purposes. 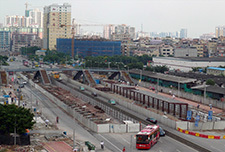 Surveys were carried out before the BRT and at least once each year since it opened in February 2010. Bicycle facilities included in the BRT planning and design included a bike sharing system, bike parking facilities, and segregated bike lanes (though these are not continuous in many locations). The result has been both a large increase in cycling (bike volumes have doubled during the morning and evening peak periods at Tangxia, between December 2009 and January 2014) as well as huge improvements in the perceived quality of bicycle facilities. 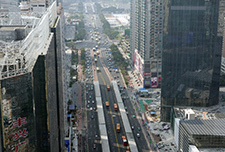 Before the Zhongshan Avenue BRT opened, 47% of cyclists in Zhongshan Avenue either 'disagreed' or 'strongly disagreed' with the statement that 'the quality of bike facilities on Zhongshan Avenue is good'. Only 15% of cyclists agreed. After the BRT opened, those agreeing or strongly agreeing that bicycle facilities along the BRT corridor are good has increased to 78%, while those disagreeing has fallen to 5%. Thus satisfaction rates with bicycle facilities soared from 15% to 78%, and dissatisfaction plunged from 47% to 5%. On the non-BRT corridor surveyed for comparative purposes, satisfaction with bicycle facilities also improved over the period, though by a much smaller margin, from 32% to 52%. Rates of dissatisfaction in the non-BRT corridor were essentially unchanged over the same period. Dissatisfaction rates with bike facilities in the BRT corridor were twice as high as the non-BRT corridor before the BRT opened, and are now four times lower. Respondents were asked about their perceptions of safety riding a bike on the two corridors. Before the BRT in Zhongshan Avenue was implemented, less than a quarter (24%) of cyclists in Zhongshan Avenue either 'agreed' or 'strongly agreed' with the statement that 'I feel safe riding my bike along Zhongshan Avenue'. More than half (51%) either 'disagreed' or 'strongly disagree' with the statement. After the BRT was implemented these positions were emphatically reversed. More than half (56%) now 'agree' or 'strongly agree', and only 14% either 'disagree' or 'strongly disagree'. Satisfaction rates have more than doubled, while dissatisfaction rates have fallen by more than two-thirds. Meanwhile in the control corridor rates have remained roughly constant over the same period. 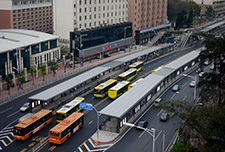 Bike parking facilities were also dramatically improved with the Guangzhou BRT, with bike parking facilities included in the design of many of the BRT stations. These improvements are reflected in the great improvements in perceptions of cyclists toward bike parking along the BRT corridor. Those 'agreeing' or 'strongly agreeing' that 'it is easy to find a place to park my bike on Zhongshan Avenue' increased from less than a quarter (24%) before the BRT to two-thirds (66%) after the BRT. Those who 'disagreed' or 'strongly disagreed' with this statement plunged from half (50%) before the BRT to around one-tenth (12%) after the BRT. In the non-BRT corridor the rates have remained roughly constant over the same period, with 40% 'disagreeing' or 'strongly disagreeing' that they can easily find a place to park a bike, and only around one-quarter (23%) either 'agreeing' or 'strongly agreeing'. Perceptions of the security of bike parking facilities followed a broadly similar pattern, with rates fairly constant along the non-BRT corridor and large improvements achieved along the BRT corridor. In Zhongshan Avenue before the BRT, and in the non-BRT corridor, those who 'disagreed' or 'strongly disagreed' that 'I can safely park my bike for a few hours' hovered around half of all respondents, while only around one-fifth 'agreed' or 'strongly agreed'. While rates remained largely unchanged in the non-BRT corridor, in the BRT corridor after the BRT was implemented these rates were reversed. Nearly half 'agreed' or 'strongly agreed' that they could park a bike safely for a few hours, and only one-fifth 'disagreed' or 'strongly disagreed'. Clearly while there is still scope for much improvement in bike facilities along the BRT corridor, the implementation of the BRT and related bike facilities has had a huge positive effect. Bike facilities along the BRT corridor include bike lanes and bike sharing, shown here at Huajing Xincheng BRT station. Double-tier bike parking under the Gangding BRT station bridge, installed as part of the BRT project. For the results outlined above, for each sample set interviews were conducted by ITDP with between 295 and 396 cyclists in the BRT corridor, and between 236 and 295 cyclists in the non-BRT corridor.